Every Jeep Jamboree is rated from 1 (easiest) to 10 (most difficult). These ratings are based on the overall trail, not just on one or two tough obstacles. Rain can increase ratings on all trails by one or two points. Numerically higher-rated Jamborees are more likely to result in vehicle damage. Please remember, every Jeep 4×4 is subject to inspection prior to trail departure. Obstacles and terrain are relatively easy to navigate. In optimum weather conditions, some trails may not require continual use of four-wheel drive (4WD). Moderately demanding. Challenge for novice drivers. Obstacles may include: mud holes, boulders, and streams. Requires 4WD with 4-LO. Demanding. Challenge for most skill levels. Mud holes get deeper, boulders get larger, and climbs get steeper.Requires 4WD with 4-LO. Very demanding. Likelihood of getting stuck is high. Mud holes may be deep and rock climbing is more arduous. Lifts and lockers are helpful. Requires 4WD with 4-LO. 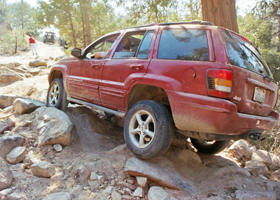 IMPORTANT: If you’re unsure if your vehicle can handle a given trail rating (some Jeep models are more susceptible to vehicle damage on trails rated 5 or higher), please contact Shawn Gulling with Jeep Jamboree USA at (530) 333-4002 for clarification. Regardless of the rating and your experience level, you’ll get plenty of help on your Jeep Jamboree. Once you arrive at your Jamboree destination, you’ll get basic on-site instruction as well. View Mark A. Smith’s Guide to Safe, Common Sense Off-Road Driving.